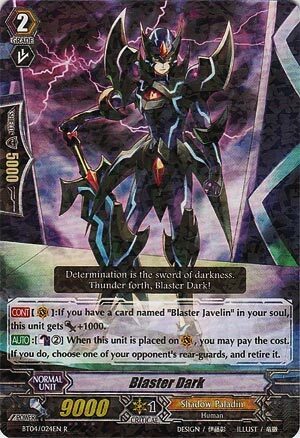 [CONT](VC):If you have a card named “Blaster Javelin” in your soul, this unit gets [Power]+1000. [AUTO]:[Counter Blast (2)] When this unit is placed on (VC), you may pay the cost. If you do, choose one of your opponent’s rear-guards, and retire it. I wonder how many of you chose to try and retire a thing rather than just save that 2 Counterblast for Nemain or Macha? If you were smart, you didn’t ever pop a card with this. Unless you got Crit-sacked and had the damage open.